A report highlighting latest details of the human cost of maritime piracy was released in London on 18 June. This updated report studies not only the human cost of Somali Piracy, but also, for the first time, examines the threat of piracy to seafarers in the waters off West Africa. It further discusses the long-­‐term psychological and financial difficulties faced by seafarers following attacks and periods of time spent in captivity. The detailed report has been developed through the combined efforts of the Oceans Beyond Piracy (OBP) project of One Earth Future Foundation, of the International Maritime Bureau (IMB), and of the Maritime Piracy Humanitarian Response Programme (MPHRP). The report's findings will be addressed at the event by Kaija Hurlburt of OBP, by Pottengal Mukundan of the IMB, and by Roy Paul of the MPHRP. Their presentations will be followed by a panel discussion of how the findings of the report fit into the larger discussion of seafarer welfare in areas of high risk, the potential for more transparent dissemination of information on the treatment of hostages, and ways to improve resources available to seafarers. Guests at the event will include a wide range of those involved in all aspects of shipping and counter piracy on the high seas. The report finds that incidents of violence against seafarers remain high, and whilst there has been an 80 percent drop of attacks off the coast of East Africa, the average period for hostages who remain captive there exceeds two years. Additionally, more seafarers were subjected to attacks and boarding by West African piracy than by Somalia-­‐based piracy. The report also includes a statistical analysis of the violence caused by acts of piracy, analysis of seafarer interviews discussing their perception of piracy, and sections discussing the different threats and economic impacts faced by seafarers off East and West Africa. According to Kaija Hurlburt of OBP, "The report shows that continued vigilance and better information-­‐ sharing is needed to relieve the plight of seafarers; as long as one hostage remains in captivity, the human cost is too high." Roy Paul of MPHRP adds: "Seafarer welfare, both during and after being taken hostage, remains a huge concern and the effects of piracy reach far beyond the days spent in captivity." According to Pottengal Mukundan of the IMB, "This report is unique in that it contains information submitted by Flag States, on-­‐line surveys of seafarer concerns regarding piracy, as well as firsthand accounts from released seafarers." 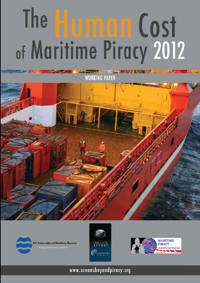 The report can be downloaded from the Oceans Beyond Piracy website.